This is the third time I have written some parts of this post due to IT issues…I hope the frustration doesn’t show! In Lanzhou we had decided to find out about renewing our visas. We would need one more 30 day block in order to complete the trip across China and were worried about whether we would be able to get this extension. Meka and I have double entry visas and I had read that it might not be possible to renew this type of visa and getting firm information about the Chinese visa situation is very hard. The only way we would know for sure was to ask the people who would be doing the renewing. This would be the PSB, the Chinese police; the guys responsible for making sure everyone was kept in check were also responsible for visas and making sure foreigners weren’t staying in unacceptable hotels of course. Thankfully at the PSB the guy on the desk said we could renew our visas and that wasn’t a problem. We now had some thinking to do. We still had about two weeks left on our visas so we didn’t want to renew them straight away so we decided to head for Xi’an instead and try and renew there hoping that they would be able to help as well. 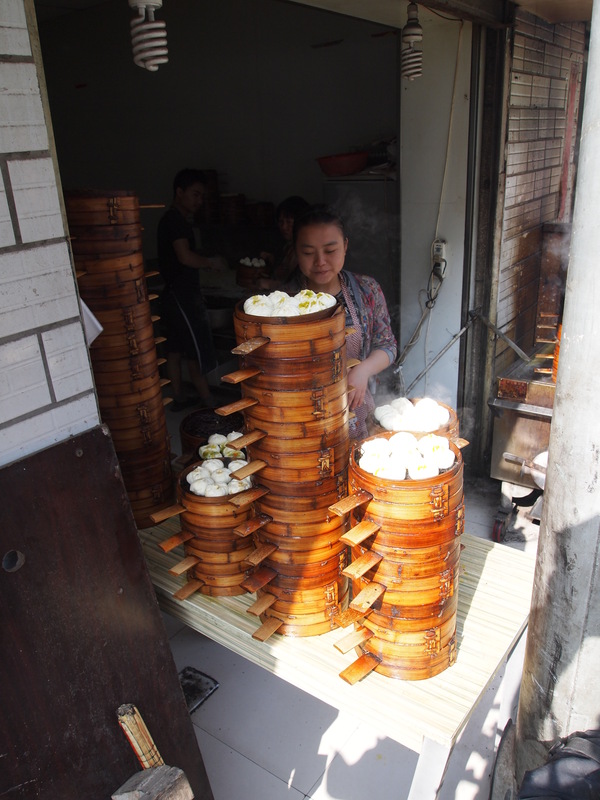 If we had to wait in a city while our visas were renewed we would rather do it in Xi’an than Lanzhou. 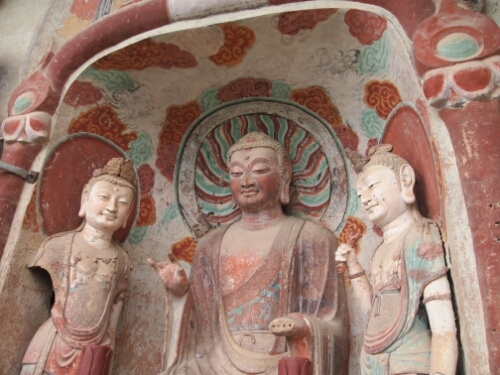 Xi’an is famous for the Terracotta warriors and its intact Ming dynasty city wall, Lanzhou is known for being possibly the most polluted city in the world. 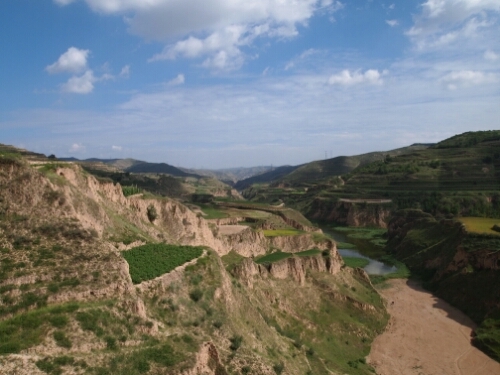 So the next day we saddled up once more and headed off further east working our way up and out of Lanzhou. Stopping for a breakfast of dumplings on the way. As we left the city we could see the haze of pollution and smog hanging over it, one of the costs of China’s runaway development. Fortunately the weather stayed fine and the day was lovely. Unfortunately this meant that instead of contending with rain we had horrible dusty roads instead. In the west of China the secondary roads are very variable, sometimes they are great, other times they are awful. That day we would have a mix. In parts, the great trucks that speed up and down them had done their work: potholing them and narrowing them by spilling the rock and shale they are sometimes carrying at the side. This debris is then packed on the tarmac causing the edges of the road to gradually encroach. It also leads to clouds and clouds of dust that you feel as grit in your mouth after riding a while. While the road was not always great the scenery was at least beautiful. I got my first taste of the incredible lengths Chinese farmers will go to in order to farm every inch of fertile soil. We saw small fields seemingly suspended halfway up cliff sides with no immediately obvious ways of reaching them. 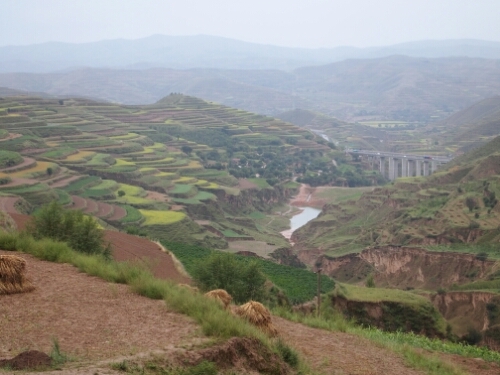 After Lanzhou I had expected the land to flatten out. This was not the case and while we were not so high, the land if anything was hillier. 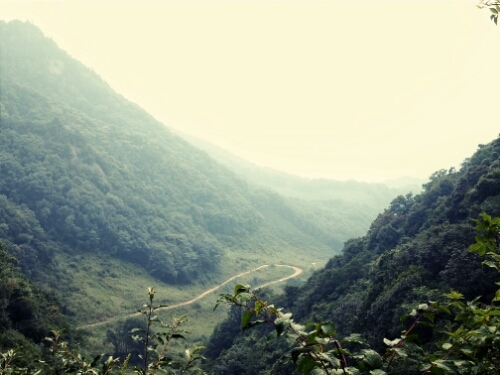 At the top of one hill I ran in to a group of about forty Chinese people sitting by the road in the middle of nowhere. I don’t know if they were visiting a small shrine or were on a break from farming but they were as surprised to see me as I was them. So while I waited for Meka to catch up I had my photo taken quite a few times. When Meka arrived they almost completely ignored her for some reason; perhaps she just didn’t look foreign enough. Continuing on we made it to the town of Dingxi, where we decided to stop. Dingxi was a fairly typical Chinese town in that a large part of it was a building site as massive new apartment blocks were built and roads were widened. Unusually we were able to find a hotel that would take us without trouble and so we checked in to a 7 Days Inn. As a national chain they seemed to have processes for foreigners even if this branch didn’t get to use them much. We were not the first foreigners to stay there though as they showed us the passport of a Jordanian man as an example when they wanted ours. I don’t know if he was the only other foreigner to stay at the hotel or just their favourite. The next morning we woke refreshed but were a little depressed to see the weather worsen as we got ready. When we were prepared to leave, a persistent drizzle had set in dampening the day. Riding off it was not long before we hit a nasty climb. This took us up a long thin ridge gradually getting higher until we reached the crest. From the top we could see other long thin ridges stretching out in different directions like fingers, creating deep valleys in between. What was more incredible was that each hillside was terraced and on these terraces there were fields. 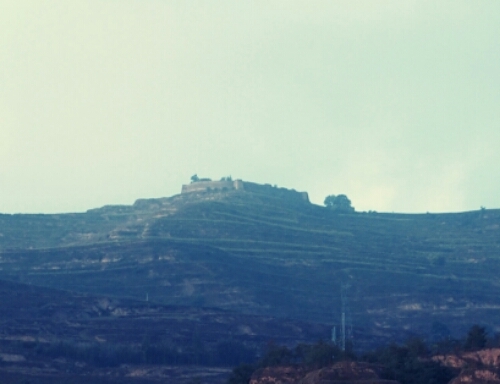 Countless numbers of these terraced fields were cut into the side of the hills all around. When you have over 1 billion people to feed I guess you get creative with farming techniques! Each of the fields must have required lot of effort to farm as there was no room for heavy machinery. I even saw one woman ploughing with an ox…old school. After riding some more we eventually came to a village and on the other side a bridge….which was being repaired. To get back to the road we would have to take a dirt track around the bridge. In the rain the dirt track had become a mud bath and I didn’t want to take our bikes through it unless we had to. So instead we rode back a few hundred metres to a highway exit and snuck up on there. This made the going a lot swifter and was preferable to being rained on while going more slowly on a secondary road. We were slightly disconcerted when we went past two crashed cars in the first ten minutes that had lost control in the bad weather. Fortunately after that we saw no more. 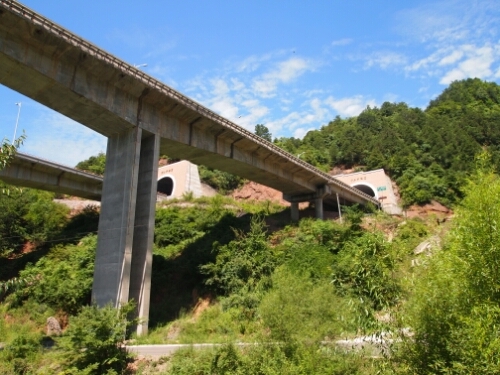 The only issue with the highway was tunnels; as the area was quite hilly every so often the highway would have to go through a hill and a couple of the tunnels we had to negotiate were very long, one was 1.5km and the other 2.5km. I hate tunnels, they freak me out. You have to ride very carefully as close to the edge as possible and the noise is horrific. Thankfully Chinese highway tunnels are pretty good as they go – they are well lit, ventilated and there are two lanes for each direction. Also it is reassuring to know that every tunnel you go through means that you are avoiding having to do an unpleasant tough climb as the secondary roads generally go up and over where the highway goes through. 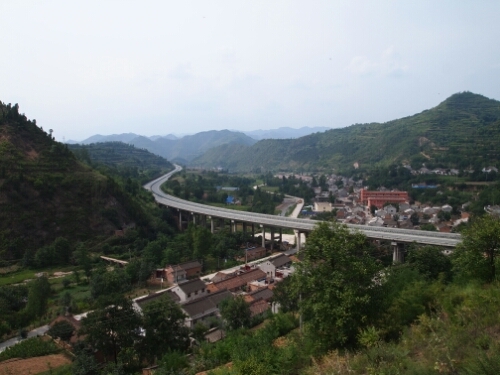 Having made it through the tunnels we arrived in the town of Wushan where we were able to find a reasonable hotel to stay the night. After checking in we cleaned our bikes up as best we could and got some more dumplings to eat. Above the town was an old fortress, one of a series that we had been seeing since we arrived in this area. They sit up on the hills above the valleys and must have been part of some old defensive network. After waking in Wushan we left once more towards Xi’an. Thankfully the weather had cleared up and the day started and continued fine. 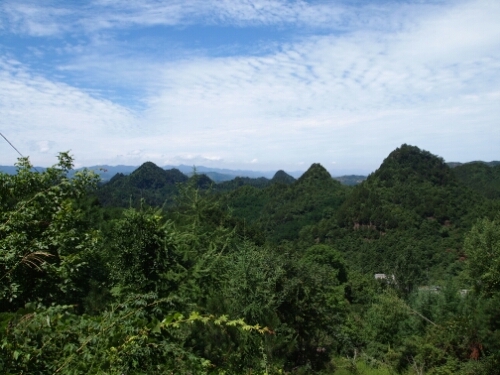 We stayed off the highway and rode through many small Chinese villages. This was interesting as we could see the locals at work gathering their crops, often by hand. Most of them carried large wicker baskets on their backs for this purpose and they would drop whatever they had gathered in there. There were many different types of fruit and vegetable being grown as well, from peaches to spring onions. Continuing on we found ourselves climbing up on another ridge covered with terraces of fields and surrounded by others in the distance. 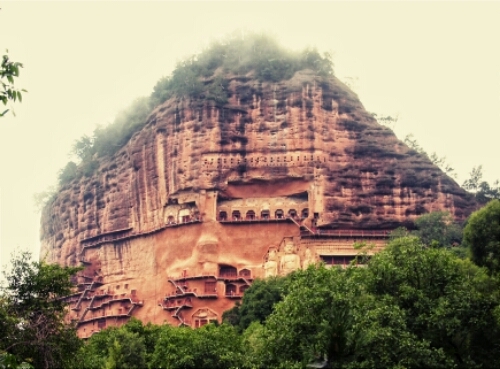 Another feature of the day was the many temples and or other buildings cut into the sides of sheer cliffs. It was strange to see windows and doors in seemingly death defying places. The most amazing thing we saw was a huge Buddha cut in to the side of a mountain and visible from the road near the town of Gunga. 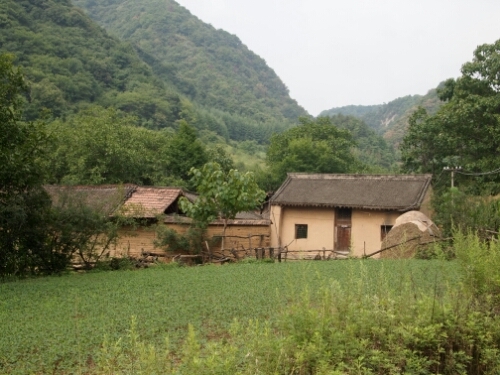 Later that day we would have another hard climb out of the valley Gunga sat in and up and down into another valley where the city of Tian Shui sits. Tian Shui is the major city for the area and it went on for kilometre after kilometre stretching down the valley with high ridges up on either side. Every so often atop a peak in the ridges there would be more of the fortifications we had seen. That or a telecoms tower. 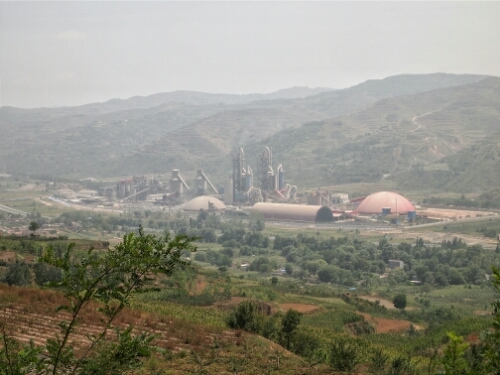 While descending towards Tian Shui we saw this massive mine sat just outside the city. They have been a common sight on this trip through China and show the massive amount of resources required to fuel the country’s incredible development. 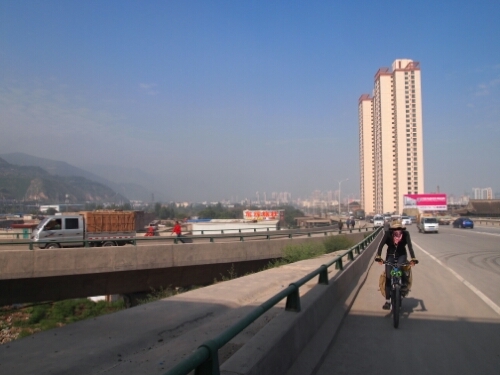 After we rode free of the city we turned onto a new road that seemed to be heading towards Xi’an and at the same time towards Maiji Shan. Maiji Shan means Haystack mountain in Chinese and is the sight of one of the four largest temple groups in China and was something I had wanted to see. I had not been sure that the road we would take would pass close to the mountain so I was pleased when it seemed to be doing so. Carrying on there still seemed to be signs for the tourist destination on the route we were taking and eventually we reached the entrance to Maiji Shan, which was nice but disconcerting at the same time as the road proper finished at the entrance. What was also disconcerting was the fact that it was getting dark and we didn’t have anywhere to stay. 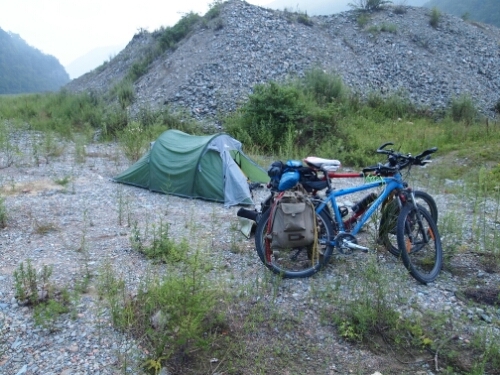 We had planned on camping but had ridden back into a populated area so that would be risky. Luckily a Chinese guy hanging about at the entrance to the temple complex spotted us and showed us a card for a guesthouse so we decided to go and see what was what. We even managed to get some reasonably tasty food helped by other guests and phone translation apps. 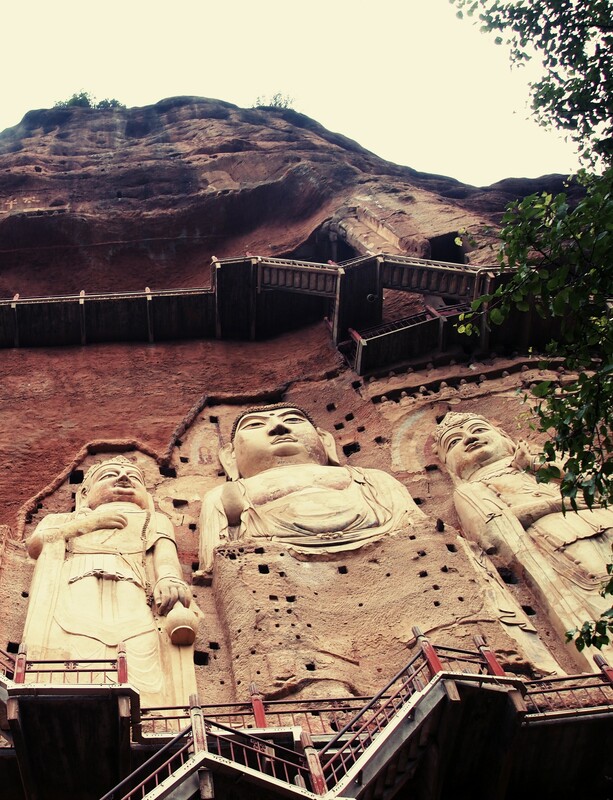 The next morning we woke bright and early and headed up to see the grottoes of Maiji Shan. For me these are easily the most amazing things I have seen in China thus far. 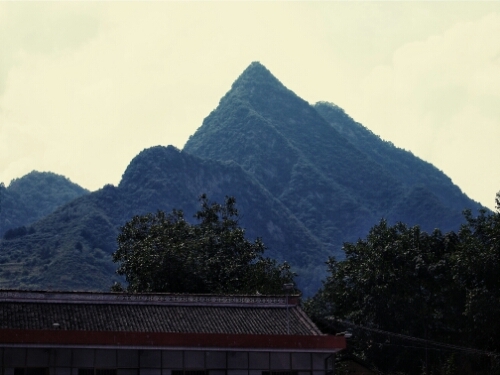 Maiji Shan itself is an unusual looking mountain rearing up out of the ground like the haystack it is named for. It is is not its shape that draws people to visit, it is the hundreds of caves of varying sizes carved into the its sheer cliff faces. No one is quite sure how the artisans managed to do this 1600 years ago as many of the caves are over 100 metres above the ground and many much higher. 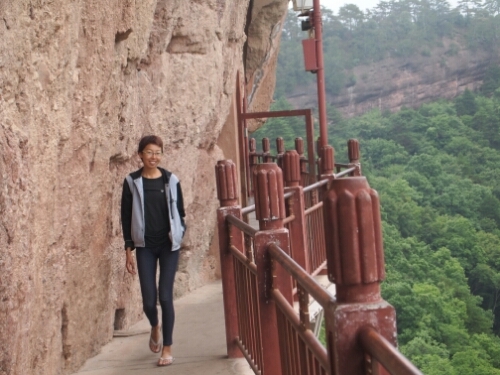 Now there is a concrete walkway built into the side of the mountain to allow tourists like us to get a better view of the incredible statues and paintings set into the mountain. The original craftsmen didn’t have the benefit of this so how they managed to do such detailed work is hard to know. 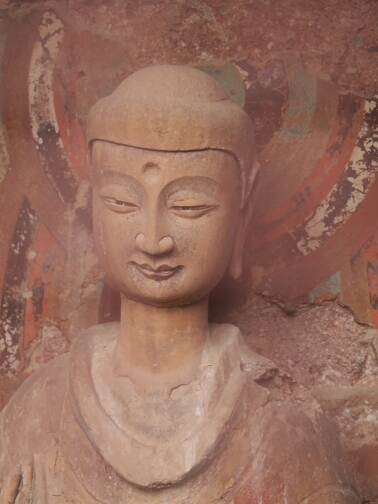 The Buddhist art work is very varied as well, there are huge statues many metres high. As well as small beautifully carved ones. And ones where it is possible to still see the paintwork. We were also lucky in the time we arrived as we were pretty much the first people into the cave area so we had the run of the place before hordes of local tourists arrived to destroy any serenity that the place created. Sadly though we could not stay at the caves all day long so we had to head back down to the guesthouse in order to get our stuff together and head back off. This feeling became a certainty as I saw the highway. The highway, which per Microsoft Bing Maps shouldn’t be there. In fact we should be on the only main road in the area. This wasn’t the case though and Bing Maps had incorrectly labeled the highway up as a secondary road and then not even bothered to put the road we were using on their maps. Looking closer and using other map sets I was able to see that the road we were using might not in fact go all the way we wanted…It was hard to tell though and I hate turning back so we carried on. At lunch we stopped for some noodles by a highway exit much to the surprise of a large bus load of Chinese tourists. Many of whom seemed to be cyclists themselves as they were wearing cycling kit. Apparently their bikes were on the bus and they were being driven somewhere to cycle. They were quite impressed with us and I have not had my photo taken so much ever before. I was dragged this way and that for various shots with people or groups of people. With my bike, without my bike, with Meka or solo. It was a bit of shock after riding for a few hours through beautiful quiet country roads. The highway itself was also incredible, as we rode up and down the very hilly terrain the highway just punched straight through or went over any obstacles. The engineering was incredible. After lunch we continued and it became very clear that we were not on a major secondary road as it deteriorated from good tarmac to bad potholed tarmac and to finally, after one small village, to a rocky dirt track. This was not good but at least there was a road…kind of. Towards the end of the day we reached another village where the road got a bit better, this must have been because the highway exited here – I assume on the basis of some future development as there was not much reason for it to stop there at this point. At this point it was hard to see where we should now go as when we carried on down our road some guys we asked said that it didn’t keep going to Xi’an. We thus thought about riding up on the highway, something that wouldn’t normally be a big problem. This time there was the issue that straight after joining there seemed to be a 10km tunnel, and one with a guard post at the entrance which we could see from the country road. Normally a tunnel would be an unpleasant challenge to get through – a guarded 10km one seemed a step too far. I had no idea what the fumes would be like in a tunnel that long and I didn’t know what the guys at the entrance would do if we went in. So we decided not to try that option and asked at the town if we could get someone to drive us through – sadly the price was too high. Instead they pointed at a road we had almost missed that they said would eventually take us to secondary road 310 after going up and over a lot of hills on bad road. This appeared to be our destiny. So after a quick dinner we decided to ride on a bit before darkness fell. We made a few kilometres on the terrible road before, as I was passing a house, a girl shouted hello and then how are you? Which was a lot more English than I was used to hearing, so I stopped on the off chance she knew a bit more. Luckily and very surprisingly she did and with her help and her father’s we were able to work out that we had come too far and that the way we were now going was wrong. The girl had more English than most people I’d met in big towns and this was literally in the village that time forgot. Her father at her direction drew us a helpful little map with the names of places showing we had to go back and turn up another dirt road at the tiny village 3km back. After thanking them we headed back the way we had come a bit then found somewhere to camp for the night off the road. Even though we were in the middle of nowhere there were still people around and trying to find somewhere secluded to camp wasn’t easy. Rather worryingly they had said it would be about 40km more on this road before we got to the 310, which would be very tough. So in the morning we woke early in order to continue and set off towards Doncha where we would apparently meet the 310. This was a very hard morning, the road really did wind up and over a lot of hills and it was incredibly bad. Going down was as bad as going up as we had to sit on the brakes to avoid being thrown if we hit a random rock and to stop our bikes being shaken apart. We were also clearly in an area that did not see many/any foreigners most people stared at us open mouthed and some appeared to shake their heads as if they were seeing things. At one village we stopped to get snacks at you could see news of our arrival spreading down the street as people poked their heads out to get a look. Eventually after some tough riding we reached a point once again where we were riding along with the highway as it had emerged from the 10km tunnel. I think we had done about 25km hard distance in the same period. It was still mind boggling the work that must have gone into building it, I’m sure that for over 100km the road must barely have touched the ground at all being either on land bridges or in tunnels. After riding a bit further we came to another highway exit and decided we would try and sneak up on the highway here. I’d checked my maps and I couldn’t see any other big tunnels so it seemed safe enough. Sneaking on was no trouble as it appeared that this was not a busy exit at all. The toll gate attended who might have tried to stop us was fast asleep slumped over his counter. The highway turned out to be a great idea, we did 9km in about twenty minutes and reached the exit that connected with the 310 with ease. Most of it was downhill through wonderful landscape and some very short tunnels so it felt fantastic after the uphill and terrible road of early. By taking the highway we saved ourselves about 25km of very tough riding so it felt justified. Leaving the highway we finally joined the 310 which was thankfully in good condition and began riding on this down to Baoji the next big city before Xi’an. The road was pretty impressive itself winding down and round a lot of hills but all the while the highway was above or to the side punching through mountains or bridging valleys. Our road even had some pretty long tunnels which was annoying as they are the main reason why I sometimes avoid highways. These tunnels were also far more dangerous than highway ones as they only have two lanes for both directions of traffic. Also they barely have any lighting or ventilation making them really dangerous to cycle in. The noise is also worse as it comes from both directions making it hard to know if there are cars behind. Still we made it through and eventually we rode down into Baoji. Here we decided we would get a train the last 160km to Xi’an. We had taken longer than expected to get here because of the issues with roads and we wanted to make sure we would have enough time to get our visas as we had heard quotes of 5 to 7 working days for processing time. So we bought our tickets, checked our bikes in as luggage and settled down to wait for the train that would have us at our destination that night.